The HINO500 Series truck Car 2 drives through the finish gate with Hino president Yoshio Shimo and mechanics on its roof. Driver Teruhito Sugawara and navigator Katsumi Hamura on the podium. 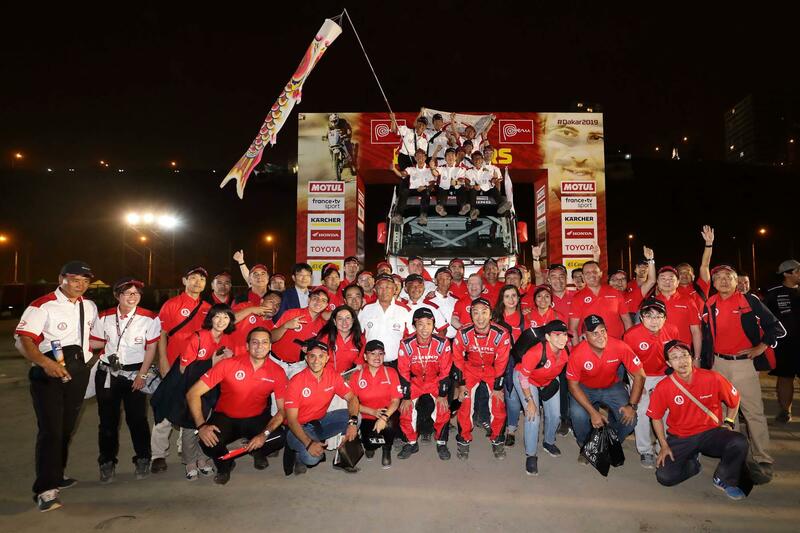 Thursday, Jan 17: Dakar Rally 2019 contestants raced their final SS (Special Stage) in the outskirts of Pisco, Peru and then took a liaison route for the goal in Lima. This marked the end of ten days of competition. 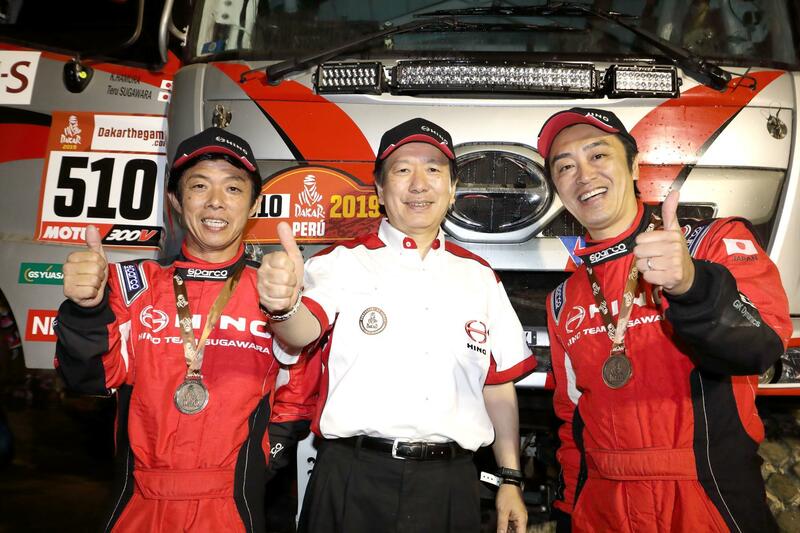 The HINO500 Series truck Car 2 crewed by the Teruhito Sugawara and Katsumi Hamura duo of HINO TEAM SUGAWARA―the only Japanese team racing in the trucks category―finished at 9th place in the category overall and extended its record of straight wins in the Under 10-litre Class to ten. The last day's SS was a 112 km loop stage set in the dune areas near the bivouac. Although it was short, the stage consisted mainly of sandy terrain, making it a fitting finale for this highly challenging rally. The day's stage also featured tough climbs that wouldn't let racers climb in one go. Regardless, the HINO500 Series truck raced at a solid pace and crossed the SS finish line at 9th place. This was followed by a 247 km liaison course which took them to the goal venue in Lima to make their 9th place in overall cumulative rankings official. The goal ceremony was held at the Magdalena del Mar Park by the sea in the outskirts of Lima, the same location where the race kicked off. The racing vehicles were temporarily parked in the parc-fermes (vehicle storage area) and then headed out for the podium one by one. 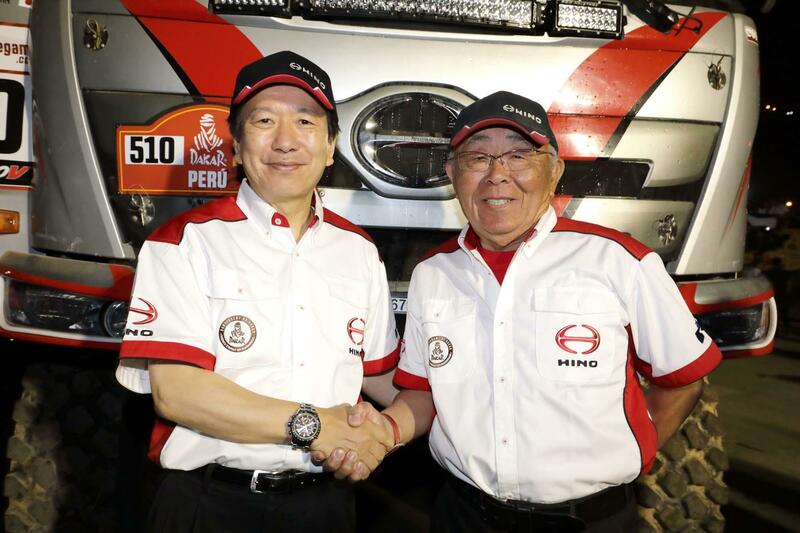 Driver Teruhito Sugawara and navigator Katsumi Hamura waved at the cheering crowd as they arrived at the podium on their HINO500 Series truck. This year's event was held entirely in Peru in South America and was three to four days shorter than previous events. It also featured more sandy stages than usual and course plans that were exceedingly demanding, making it a tougher race than conventional Dakar events. Of the 137 bikes, 26 quads, 130 cars, and 41 trucks that started out of Lima―a total of 334 racing vehicles―only 75 bikes, 15 quads, 76 cars, and 14 trucks made it to the finish line. The fact that only 34% of the trucks were able to finish testifies to the harshness of this year's race. While HINO TEAM SUGAWARA's Car 1 was forced to retire due to a steering problem early in the race, the all new Car 2 delivered consistent speed to wedge its way into the ranks of its larger rivals for a 9th place finish overall and the team's tenth straight win in the Under 10-litre Class. I'm very disappointed at having to withdraw from the race two years in a row. I am as grateful for all the support I've received as I am sorry for these results. That being said, I'm very glad that Car 2 won its tenth straight win in the Under 10-litre Class. That gives me some relief. As the navigator on HINO500 Series truck Car 1, all I can say is that I'm very disappointed that we had to retire. This truck embodied the devotion of a lot of people, so I still wonder if there was something more that we could've done, and I feel bad for our mechanics. 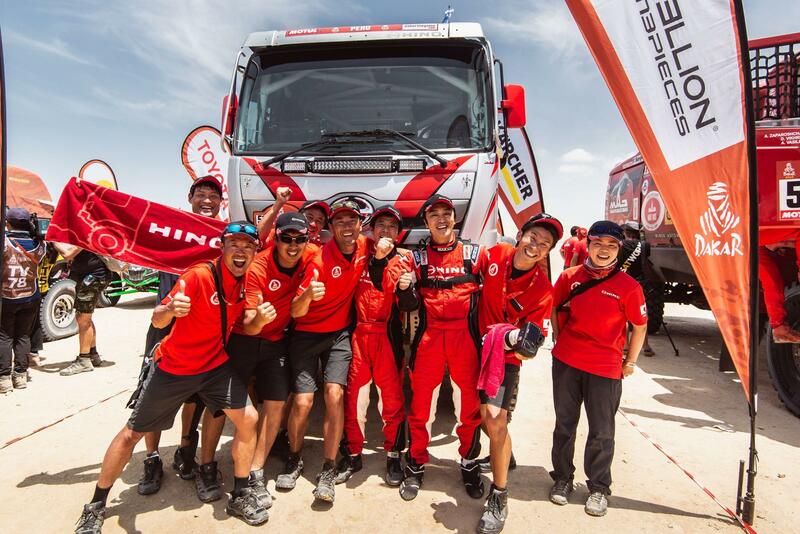 Going forward, I'm going to do what I can to get more people to support HINO TEAM SUGAWARA and the Dakar Rally. We fought on our new truck against the larger trucks who have consistently dominated the top group. While we did notice some new issues, we were also able to identify some areas where we could do things differently going forward. Just because the course is tough, we can't stay in the game by merely aiming to finish the race. I think we need to keep taking risks in our racing to make our way into the top group. We were under a lot of pressure because we ended up being the team's only truck early in the race, so I'm relieved that we were able make it to the finish line in good shape. 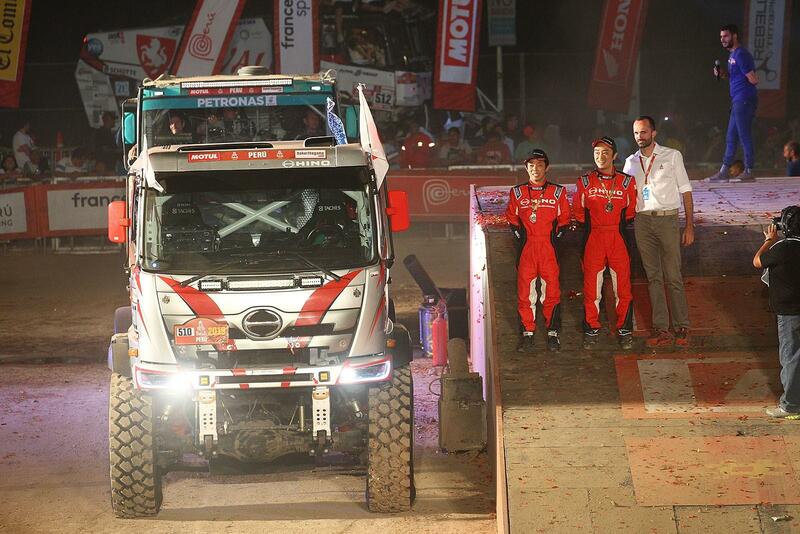 This was the first time I teamed up with Mr. Teruhito (Sugawara) in the Dakar Rally. He was aiming for a position in the top group so he drove fast, and there was a lot to learn from that. I'm relieved that we were able to make it to the finish line without any mechanics getting injured. It was unfortunate how things turned out for Car 1, but it's great that Car 2 was able to deliver good results. Another thing that hit me personally was how different the rally was from the Dakar Rally that I knew when it was still being held in Africa. This was the first time our new Car 2 raced the Dakar Rally, and although it comes with a great pedigree, we learned that there was still a lot to do, for example, in terms of suspension settings. For now, I'm glad that we were able to finish in the top 10. Now that we're at the finish line, it's kind of sad to think that it's all over. I was able to fulfill my responsibilities, but there were things that I could've done better. It was really unfortunate that Car 1 had to retire. I think that put a lot of pressure on Car 2. The entire year has been a priceless experience for me as I've been on the team from the truck building stage. My feelings about Car 1 are that much stronger, so I was very disappointed that it had to retire twice, once from steering problems and once in the Semi-Marathon. I will continue to build on my abilities and would like to take on this challenge again if I get another chance. The bivouac was more like a fight for survival than a camp. It was fun to be on a team where we were all working towards the single goal of getting our racing trucks in the race. That gave me a great sense of purpose even in those extreme conditions. There isn't anything we can do about the problem that Car 1 had, but I feel frustrated that the problem itself was something that you might come across on a production truck. I'm 42 years old now, and I have to say that working on a Dakar Rally team as a mechanic has been a great experience. I hope my juniors get a chance to experience this too. I don't think you can appreciate the challenges of this extreme rally unless you actually experience it. The day after the rest day was physically the toughest for me. Now that we're at the finish line, I'm relieved that we made it. I still hope that we could've gotten both trucks to the finish. The days just flew by up to the finish day. You don't really know what day of the week it is when you're on the site. I work at the Vehicle & Module Evaluation & Engineering Div. 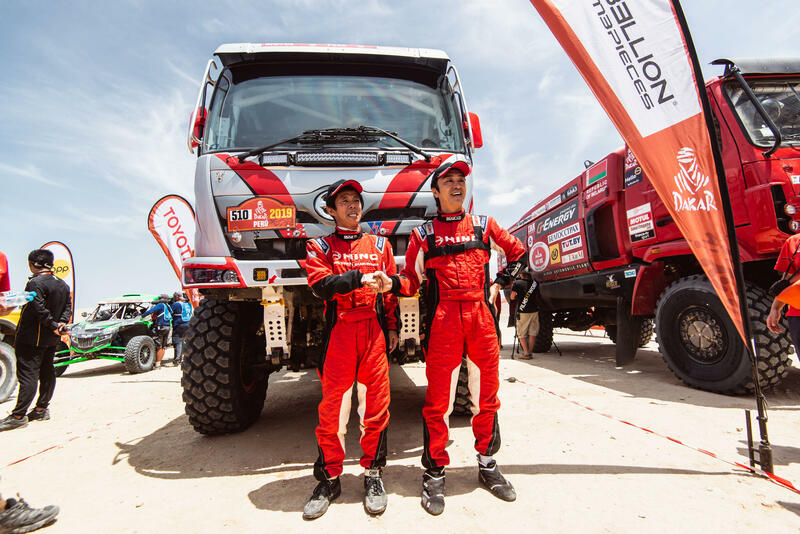 at Hino at Hino Motors, and when I look at the rally trucks, the ways that they break are completely different from how production trucks break. There were many more heavy-duty servicing jobs than I expected and that gave me a glimpse of how extreme this rally is. Time just zipped by. The teamwork between us mechanics is so good that it's too bad that we have to end it here. It felt very good working as the leader for Car 2. I'd like to ride in one of our rally trucks one day if I can. Driver Teruhito Sugawara relaxes at the Pisco bivouac. Navigator Katsumi Hamura is relieved to have made it through a very difficult stage. Mechanics inspect Car 2 back at the bivouac in preparation for the final stage. Car 1 unfortunately had to withdraw from the Semi-Marathon.